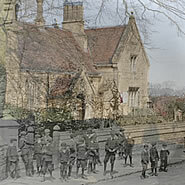 I’ve just posted the first of what I’m hoping will become a series of ‘then and now’ photos. Just click the button and watch as the past turns into the present. The difference in camera lenses means it’s not easy to create an exact match. But with the wonders of Photoshop, I can get pretty close. Click here to view the first attempt on an early 1900s photo of Waltham School. And click here for a list of all our ‘then & now’ transitions.